One Palestinian woman has been killed and one wounded by Israeli security forces in the latest “stabbing attack” incidents in the West Bank. Defense Ministry guards shot dead a woman on Monday morning, saying that she approached them with a knife near the Israeli settlement of Alfei Menashe. I’m ending my path, and I’m reaching this end with my full mental capacity, in defense of my homeland and the young men and women. I can’t bear what I see any longer. All I know is that I can’t take it. To my mother and brothers, please forgive me. On Sunday, an Israeli security guard wounded a woman after she stabbed him at the entrance to the Israeli settlement of Beitar Illit. Security footage showed the woman pull a knife from her purse and lunge at the guard, who was “lightly injured”, according to Israeli officials. In another incident on Sunday, two Palestinian attackers wounded an Israeli man who was shopping inside the West Bank village of Nabi Ilyas. The victim was seriously wounded but was able to drive to a nearby Israeli military checkpoint. The Palestinian men fled the scene. Earlier in the day, a Palestinian man rammed his car into Israelis at a bus stop in the northern West Bank, leaving two people seriously injured and two others lightly wounded. The driver was shot and killed. More than 70 Palestinians were killed in October by Israeli security forces. 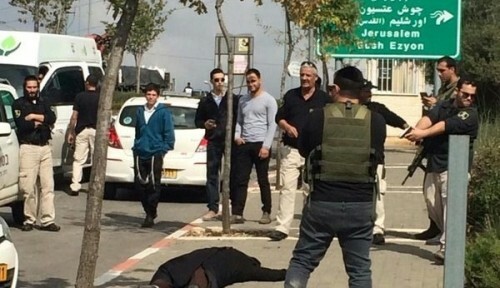 Ten Israelis were slain by Palestinian attackers, mainly in stabbings.